BSP supremo Mayawati Wednesday termed the Akhilesh Yadav government in Uttar Pradesh as “anti-Dalit” and alleged that it was protecting the interests of Yadavs only. Mayawati’s comments came a day after the state Cabinet, citing a Supreme Court order, approved a proposal to demote 64 engineers of irrigation and state water resources department who were given consequential seniority in promotion under reservation by her government. “The Supreme Court had not stopped reservation in promotion. In fact, it had found reservation in promotions justified but had set certain conditions to make the process strict,” she said, adding that the SP government was supposed to fulfill those conditions but it reverted the promotions, which clearly shows its “anti-Dalit face”. She said Dalits will not attend the Dalit Sammelans that the ruling party has planned in Azamgarh, SP supremo Mulayam Singh Yadav’s constituency. Hitting out the state government for allegedly favouring Yadavs in appointments, Mayawati said, “BSP is not against any particular caste. But, if the government is being run by a son of Yadav caste, that does not mean that interest of only that one caste should be considered while others are ignored”. Stating that the law and order has failed in UP, Mayawati made a fresh demand for imposition of the President’s Rule in the state. “I again demand imposition of President’s Rule in UP… Since the Samajwadi Party came to power, all types of crimes are being committed. It has shaken the confidence of people,” she said. She said the manner in which the woman was allegedly torched at a police station in Barabanki was shameful for the government. Mayawati said even when the woman gave a statement, the CM was trying to downplay the incident by ordering a magisterial inquiry. “He should have terminated the accused policemen and sent them to jail,” she said and accused the CM of protecting the erring policemen because of “casteism”. She termed the recent dharna by BJP MPs as a “drama” and said if they were so concerned about law and order situation, then “instead of indulging in theatrics, they should create pressure on the Centre to impose President’s Rule in the state”. Teeming both the SP and the BJP as “weak parties”, she accused them of trying to trigger communal riots to polarise voters ahead of 2017 Assembly elections in state. Attacking the BJP-led NDA government, Mayawati said the Centre was only protecting the interest of capitalists and corporate houses. She alleged that all big projects were being given to private sector where reservation was not applicable. 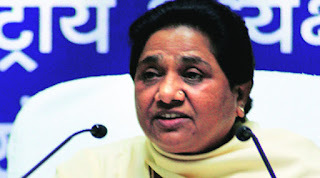 To a question as to whether BSP will have truck with All India Majlis-e-Ittehadul Muslimeen, she ruled out any electoral alliance with any party. Reacting to Mayawati’s demand for imposition of President’s rule in UP, BJP said the BSP supremo has no respect for the democratic system. “It is a democratic country. Mayawati, who had ruled the state like a dictator, wants every government to act like a dictator,” BJP spokesman Vijay Bahadur Pathak said.